Welcome to the New Year! I know it has already been a few days, so some might say this is a little late, but I felt like yesterday was the first real day. Alarm went off, shower went on, coffee was poured and *chilly* commute was made. I'm sure it was the same for many of you, the first day back to work, the first day, as I told D., of being a real human again. I say real human as opposed to couch creature with no schedule, responsibilities or resistance to cookies. Thus, real humanness has resumed, somewhat regretfully. Yesterday all my favorite reads were filled with resolutions. I too am resolved in all the typical ways of consuming less and accomplishing more. The big one, however is saying "yes." Yes to concerts, yes to museums, yes to adventures, yes to breaking out of the everyday humdrum and routine to live each day instead of surviving it. Heavy. Not really, I mean, that sounded a little dramatic. I just want to get out there and have more fun, without worrying about dishes, laundry and general real human requirements. So it's yes to yes, yes to more, but maybe not yes to cookies (sometimes). 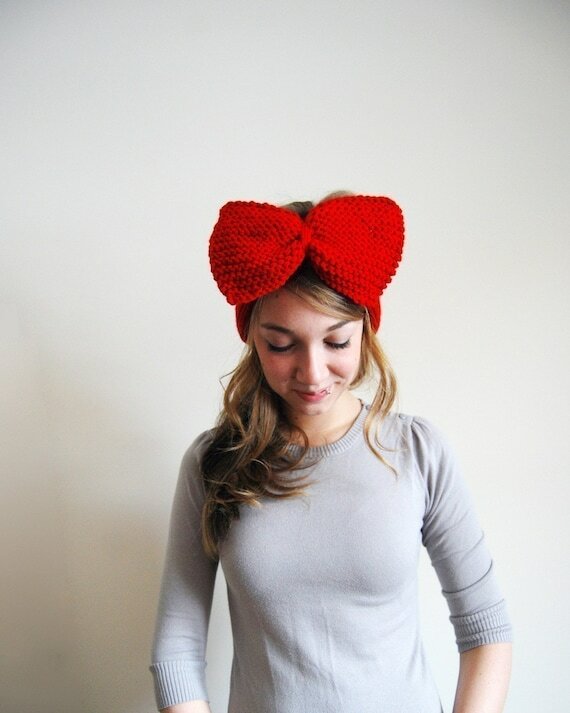 This spirit of yes seems epitomized by these rad bow ear warmers created by the aptly named YesJess on Etsy who has a slew of cute knitted goods in her shop. I give them to you as a yes for today. Mega-wedding post coming later this afternoon - fair warning for those of you who have had enough of that mushy stuff. This hat is good if you naturally look like a fairy princess. For the rest of us...I suggest just wrapping a scarf ALL the way around our heads.